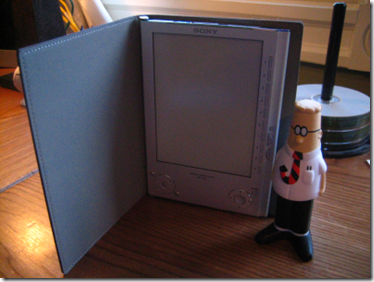 Step Aside Kindle – Hello Sony eReader! I wanted an eReader of some kind. I knew that. This is a cool technology. First off, no matter if you get an Amazon Kindle or a Sony eReader, then you are in for a definite treat. This is one cool gadget and if you like to read books or magazines or whatever, then you are going to love the portability in carrying an easy-to-read library with you in a nice convenient little package such as these gadgets offer. For those that haven’t seen this in person, the big deal with this all is the piece of the gadget that neither Sony nor Amazon invented – the E Ink screen! You can read about E Ink here on Wikipedia. So with that bit of news, don’t be all amazed that Amazon or Sony invented something wonderful. They really haven’t – it is all about the screen. The only way in which Amazon or Sony then can make a difference in the product is how they go about letting you view items with the screen. It comes down to the device that they built around the screen and the software that they use to make it easy for you to view items on this wonderful screen. I don’t want to explain how the E Ink screens work in a lot of detail. For that you can read the information here (I suggest that you do as it is a cool thing). Basically, the best part of the E Ink screen is that it is not like any display device you have ever seen. It is clear and easy to read things like text. It is not at all like a backlight display, but instead is more like an old Etch-a-Sketch. It draws a screen of images or words (you can view pictures) with wonderful detail and it looks to your eyes as if you were viewing a traditional light gray paper from a book. The other thing is that due to the technology of the screen, battery life basically lasts for a crazy long time (week-weeks). The only electricity used is when a new screen is redrawn. Redrawing screens is rather instantaneous as well. When you are viewing a screen of text, you are not consuming any battery power from the device. Amazing. I got my first view of an eReader when my boss strolled into town carrying one and after I saw it – I was hooked. After quite a bit of research on which one I was going to get, I decided on the Sony PRS-505. There are a lot of reasons for this, so let me get into them for you. The Sony PRS is more “open” allowing you to get more of your documents, ebooks, etc on the device. When it comes to formats, you are able to get on your documents quickly and fast. Though the Kindle touts a wireless capability to get your documents onto the device – this is somewhat limited when you actually get into it. Also – there is absolutely no issue in just plugging this device into a USB jack in your computer and transferring over the files that you need. All you are doing is doing a copy-and-paste. Also – you are going to need to do this every now and then to charge the device. Though Amazon touts this as a feature – it actually is somewhat limiting as there are only specific formats that you can grab wirelessly. If you dig down into it, some of the biggest reasons the wireless is there – is that it makes it easy for you to buy new books wirelessly without needing to connect to a computer. If this is a really important thing for you, as you might be always on the road or something, then this is something that you really might want to consider. If not, you won’t feel limited by not having wireless on your Sony. The Sony PRS can deal with the following formats: BBeB (LRF), PDF, TXT, RTF, ePub, LRX, MP3, AAC, JPEG, GIF, PNG, BMP, RSS (sweet). The Kindle supports the following formats: AZW, TXT, MOBI, PDF, DOC, PRC, HTM, LIT, LRF, PDB, RB, IMP, ePub. Looking over these lists, you might think that some formats are really missing from this list. These are just the formats that the devices accept and there are tools out there that will convert all sorts of other formats to something that is good for your device. The best tool that I found out there so far is called calibre. This is a free download. So this means that you are easily able to convert your .doc files to .rtf to be read just as well on the Sony PRS. One of the better things is the RSS capabilities of the Sony PRS. Though the Kindle touts RSS capabilities as well – they only let you use the wireless to get to their few chosen RSS feeds. Using the Sony PRS, you are able to point to *any* RSS feed and then pull that content onto your device. With the program calibre, you are also able to pull nicely formatted magazines and newspapers to your device. You are also able to use navigation and get right to the story that you want to read. Though, you can also use the zoom button and the Sony PRS will then reformat your PDF document and you will be able to see the text larger (it won’t be viewed basically as an image at this point). The text lines are somewhat cut off, but from this figure, you can see that it looks quite nice. Actually, the two figures here, show a PDF in the medium and large zoom sizes. The other option is to change the view entirely by rotating the view. For this, simply press and hold the zoom button for a few seconds and then the PDF will be rotated and you will be able to read the top portion of the PDF and then when you press the next page, you will view the bottom portion of the PDF. Obviously, when working with eReaders, you need to organize your library on the device as you will end up with a lot of material that you will need to wade through. As you can see from this screen, you are able to access content via a number of different means. You are also able to bookmark items as much as you want using the bookmark features. It will remember where the last point you were in each book and when you go back to a book or document, you simply need to press ‘Continue Reading’ to start again. 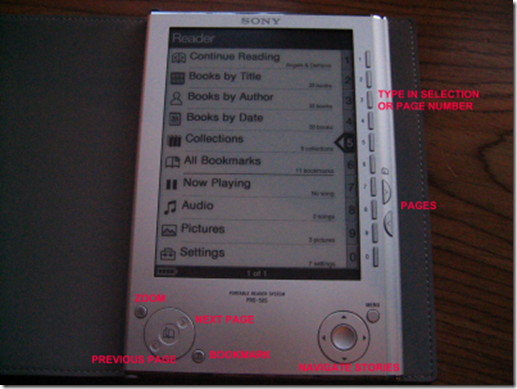 The Sony PRS, when turned back on, will go directly to the last page of the last book that you were reading. The Sony PRS comes with a nice leather cover that is a little larger than the device and therefore protects it quite a bit. The cover is thick and feels good held in your hands. It also has some magnets built into the corners and stays conveniently closed when put away or thrown into your backpack or briefcase. 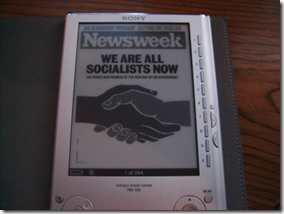 Comments on this post: Step Aside Kindle – Hello Sony eReader! # re: Step Aside Kindle – Hello Sony eReader! Nice Review! 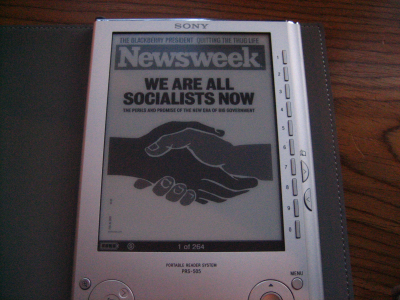 I also bought Sony Reader couple of months back and really enjoying it. The old sony software was kinda weird and the font sizes were really a problem but the new software is amazing. It is much faster in processing and the font sizes are more reasonable. I have seen the new version of the Sony Reader (Touch Screen) but the screen quality is not as good as the old one. I like this. I think too many people discussing ebook readers are focused too much on small size and text reflow. The ability to render some items the way they are designed, like code, is a real key and it looks like this Sony might nail it. I have been a long time Sony PRS user. I have had two different versions of the unit over the last 3 years. I finally gave up on it and picked up a Kindle 2. Main reason? Limited selection of books on the Sony store. Amazon selection of NYT best sellers, business books, et. al is much, much better. I will know next week when I get the new unit. With regards to limited selection to books on the Sony store. I have a reader and I get my books from others sites. I have found booksonboard to have a wide variety in books to chose from. If you feel limited in selection then surf the web. So, my issue is why try to have anothe device? Why not use an ereader on your palm, window mobile, or iphone? It seems marginally better to have a dedicated ereader than having the actual book. The reason is really due to the screen technology used here. It is not a normal screen that you now and love from the past. This is something quite revolutionary. It appears as if you are reading a real book. For those that can't imagine ever reading a full book on their computer - this is the device for you. I still don't get why geeks would bother with one of these. Many of us have a PocketPC phone or iPhone we are carrying anyway. 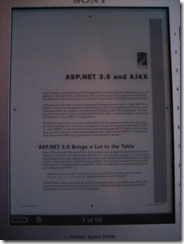 I have been using Mobipocket for years on the PocketPC phone and now eReader on the iPhone and they make a wonderful eBook reader, particularly for non-technical content where you don't need a lot of screen real estate for code snippets and such. Why carry one more big clunky device when your phone can do it well already? I find this better than reading a real book in bed now. It is faster to read (don't have to turn pages) :) and I can read 1,000+ page books easier as this device is thinner than the actual book. Magazines, newspapers, PDFs --- that would be horrible to read on a mobile device. Also --- seriously the screen is everything for the eReaders. # but can you edit PDF, like highlighting text etc? I'm pretty attracted to this concept. I've got several thousand journal articles in PDF that I routinely refer to, and over time I've done a bit of note taking in them, mostly just to highlight or underline important text. Could I do that with the Sony or Kindle readers, and then pass the pdf back to my computer? Nope ... you can't do that with either. 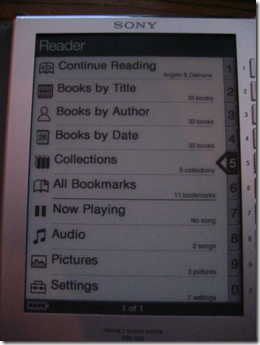 Can you download e-books from Amazon onto the Sony e-reader? Great information about the Sony Reader. I originally was planning on buying a Kindle but decided to go with a Sony. I got more great info about the Sony readers from www.electronicbookreaders.info. Check it out! Thanks for the awesome review! You articulated the reasons for the Sony device very clearly. 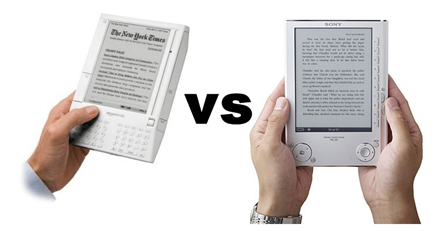 To the question "why would you want a e Reader when you have already have a pocket device". You must not read many books. Do you want to read a page of a book on a 2X2 or less screen. That isn't even taking advantage of the E ink technology? Yes, just like having an IPOD for music I want a e Reader for reading. Got to have those gadgets. One size does not fit all! To be honest - I haven't much thought of battery replacement. It's not like there is a battery problem. One charge will last 2 or 3 weeks. The Sony e-reader does have some screws on the back, so you are able to open it up. I haven't done so though. I'm with Candy! I really want one but I keep going back and forth between them! BUT - having to send the unit back to Amazon for battery replacement - no way! AND - I rad you have to send you docs to Amazon for them to put on your Kindle. I want to be able to put my own documents on there. I guess I just decided (AGAIN) that the Sony is for me. What I REALLY want is the Sony 700 because of the ability to highlight, etc. But I can't deal with the reviews about the screen. I see people talk a lot about the screen of the PRS-700. I bought this unit becuase I have serious vision problems from a stroke. I have no trouble at all with reading on this machine. 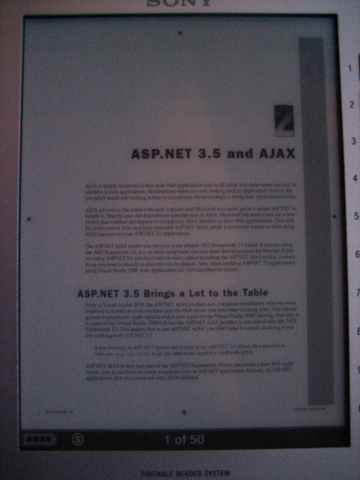 Granted I use XL type, but reading during the day the screen is clear and easy to read. Reading at night, I use my bedside lamp and again reading is easy and clear. You can get a glare if you have the reader turned away from the light or with the light coming into it sideways. However, the built in light is convenient on the train or even in a low light area. My friend sent her Kindle back and liked my Sony e-reader so much she bought one. I cannot figure out exactly how to get a newspaper or rss feed onto my ereader but I am sure I will get someone to give me step by step instructions. The reader is comfortable to hold, easy on the eyes, holds a charge for at least two weeks, and holds as many books as I can read in a month. To get free newspapers and magazines - use this free application http://calibre.kovidgoyal.net/. Nice review thanks for all the imput. As for why anyone would want these devices instead of using your phone? I personally don't own a phone that is capable of reading books on and even if i did i wouldn't. The screen is much to small for reading on. I use to have a blackberry that i wouldn't even go online w/ cause i cant stand the scrolling which is also why i dont read on my pc. As for battery replacement, I have an ebookwise 1150 reader. I've had it for about 6 years now and haven't had issues w/ the batteries yet and it needs to be charged much more often than the sony because it is a touch screen backlit unit. But i'm sure when and if your battery needs to be changed someone will have come up w/ a replacement battery for you. I am in the market for a new reader as EB1150 is getting frustrating w/ it's lack of support for the most popular formats. I have found most of the main stream books i want do not come in a format that is usable on my reader. 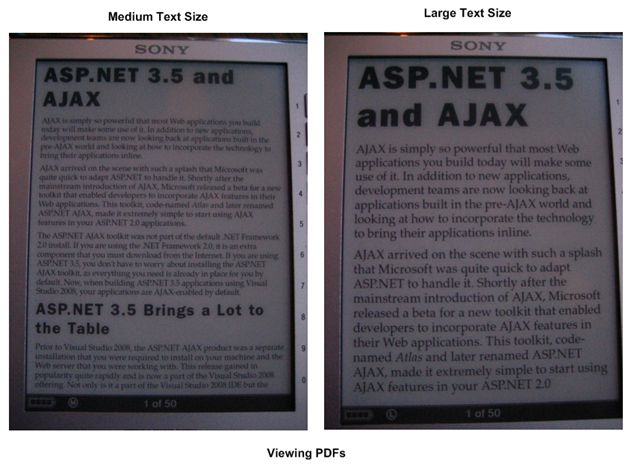 I gotta say the sony reader w/ all it formats looks promising to me.. I am looking to get an e reader for my son who has dyslexia. It would be useful if the could also read out the words. Does anybody know if this a feature in either unit? Joe - the Kindle 2 definitely has a text to speech feature that apparently isn't too bad. It also has an integrated dictionary. Currently waiting for my Kindle. Sony was never an option, since the worldwide connection to the Amazon store clinched the deal for me. my new ereader battery does not seem to hold its charge ?????? check your USB charge setting in your computer. DO NOT WASTE YOU MONEY on a one of those $10-20 devices that says it will charge USB devices and is nothing more than an adapter/transformer from household power to 5.2VDC. NOTHNG other than a TRUE usb/computer connection or external 5.2VDC power supply seems to work on these. I have tried 3 different usb "hub" chargers on 6 different readers and the results are always the same. Actually the magnets are in the reader, not the cover! Read the comments with interest. I have a Hanlin V3 which I think is more similar to the Sony than the Amazon. You can get books very cheaply off the net in a variety of formats, I like using PDF (better layout) then converting with Calibre (free software, amazing programme)which can convert from virtually anything to anything. My Hanlin likes mobi best and converting with Calibre from PDF to mobi is quick and easy and then I copy onto the SD card I use with the Hanlin. I got a PRS 600 for Christmas. One of the deal-clinchers for me was that I can check out library books on it, and you can't with the Kindle. Plus, it's smaller than the Kindle, which means less weight in my bag. I love being able to make notes, draw on the pages, and highlight, something else you can't do on the Kindle. The touchscreen is nice, the only issue I have with that is if I close the cover while the reader is still on, it will fast forward. Sony knocked one out of the ballpark with their ereaders! Can you download books from Amazon to a Sony? 5) A charger has to be purchased separately to avoid useless USB charging. 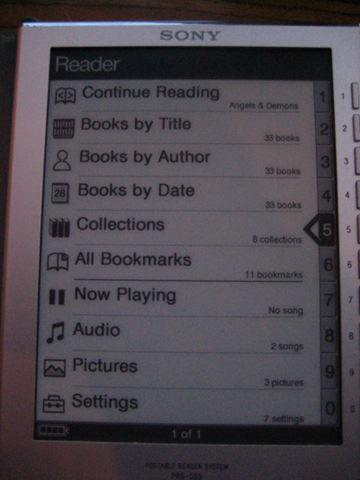 I got my eReader as a birthday present in June. In August I had to waste over an hour of my time when it faile to sync the books I purchased. I ended up learning how to reset it. Today, I took it off of the charger and the display screen was shot and it's only 4.5 months old. (I'd like to note that it does not come with A/C charger and I don't like bringing my laptop on vacation so that's an expense not covered in purchase price). I called for service to learn that there is only a 90 day warranty on labor. I have NEVER dropped it, exposed it to direct sunlight or water, etc. Now I have to send it in, pay the labor and I won't have it for vacation next week. Overall, very DISsatisfied.